Just come back from the cinema after watching this and I have to say I am really dissapointed with it! I walked in worrying about as it is obviously a conversion and one of the poorest I have seen. During the POD race I found it at times hard to see what was going on due to blurring. Me and my friend also spotted a few extra bits added in perhaps to cover up and draw your attention away from the bits they either didn’t convert or converted extremely badly. 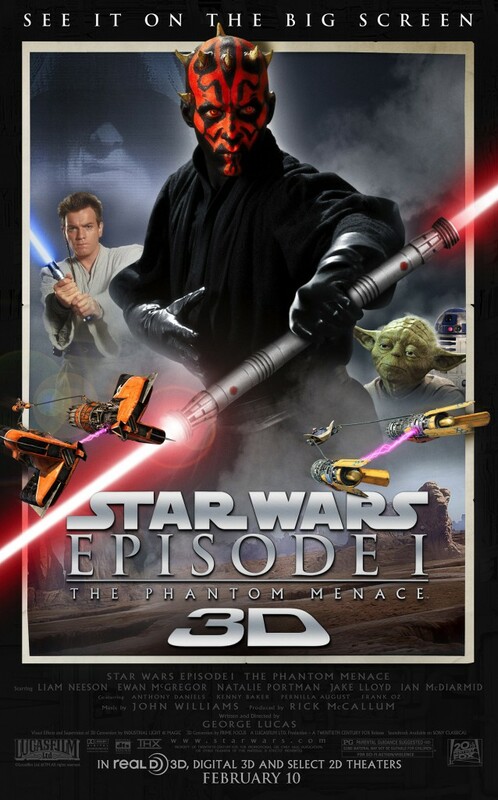 There really wasn’t any good parts that looked good in 3D and I am a big BIG Star Wars fan. Don’t waste your money on seeing this on the big screen, wait until release and then make a judgement. Huge fan of Star wars! What a crap reproduction into 3D. there was nothing coming out of the screen. If there is nothing coming out of the screen you would imagine amazing detailed depth in a movie. In scenes where the focus was on main characters this was good but the background was all out of focus My blue ray 2D version is by far more crisp and detailed for backgrounds. Why don’t they create a new Star wars Movie that is specifically filmed for 3D to keep there keen followers happy. OMG…Just saw it. This is horrible…should be pulled from theaters immediately. Its worse than my TV doing 2D-3D conversion. Be patients, the true 3D conversion is coming with Titanic 3D. All the people who had the chance to see it had one word to describe : amazing. Even with trailers, we can see the difference between the “rotoscopic stuff” from prime focus and the Titanic’s conversion made with time, money and the true respect of the original material. Just left the theater after 20 minutes into it. The theater couldn’t get the 3D to work and it was just blurry. We will be going back another day to see if it gets any better since they gave us a refund on a gift card. I thought it was a perfectly serviceable conversion. Towards the beginning, most of it was too flat, but it seemed to improve as the film went on. The shots of the vast battlefield toward the end looked really good, the podrace scene was great as expected, and there were in fact a few minor pop-outs. Even most of the dialogue scenes and close-ups had noticeable 3D. The lightsaber duel was intense enough that I wasn’t really paying attention to the 3D. There were a few errors I noticed, but nothing as distracting as in Immortals – though most of that movie was deeper. There were some cardboard cutouts, but it wasn’t the norm. I was satisfied overall. It is very clear, though, that the focus was on technical competency and quality control rather than a “wow-factor”. It’s certainly miles above The Last Airbender. I’d say the level of depth and pop is similar to Thor, but there’s more roundness and fewer artifacts in Star Wars. I took my 8yr old son to start an epic sequence of events, all 6 on the big screen in correct order. It should have been left in 2D. Far better than the Blu-ray and well worth the effort. Big fan of Star Wars and 3D in general but this was not well done. I did not see the blurring some saw but most scenes were pretty flat and the humans looked like cardboard cutouts. The big CGI scenes just had to be rendered in 3D so they looked very good. If they do more of the series I doubt I will be spending my money.